Somewhere I had read that Maskerade was the last Discworld book featuring the Lancre witches. Worse, I believed it, so I was both a little surprised and a lot pleased to pick up Carpe Jugulum and find that they were back. Pratchett dispensed with the traditional opening — “When shall we three meet again?” — because numbers are still something of a sore point for his witches. Magrat is still a Queen, as she has been since the end of Lords and Ladies, and Agnes, a.k.a. Perdita, is of two minds about the whole witchy business. 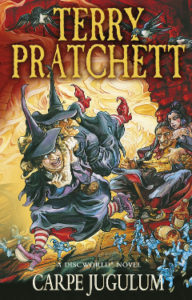 Pratchett combines three main elements to set the machinery of Carpe Jugulum in motion. First, he has the structural problem that Granny Weatherwax has grown considerably in power since she was first introduced to readers back in Equal Rites. As Nanny Ogg noted in Maskerade, witches whose power grew unchecked tended to come to bad ends, or to just go away somewhere far from mortal ken. Granny is still very much in the danger zone in this regard. Second, the King and Queen are about to have their first child, so naturally there will be a naming ceremony. The witches are invited, but it wouldn’t be a proper story if all the invitations arrived and all the witches attended and none of them got offended and nothing went wrong, would it? Third, as the title implies, vampires show up. This particular vampiric family is looking to expand their demesne and has chosen Lancre as a tasty addition. By way of setting up all three, Pratchett writes a scene that’s as deft and devastating as anything I can think of in Discworld to this point. Granny Weatherwax has been called to help with a birth. The midwife sent someone a-running because things were all going wrong. There was, if you were listening for it, just the suggestion of a question in that sentence. Granny focused her mind. “It’s a boy,” she said. Mrs Patternoster didn’t bother to wonder how Granny knew, but her expression indicated that a little more weight had been added to a burden. “I’d better go and put it to John Ivy, then,” she said. She’d barely moved before Granny Weatherwax’s hand locked on her arm. “He’s no part in this,” she said. Mrs Patternoster looked into the blue stare and knew two things. One was that Mr Ivy had no part in this, and the other was that anything that happened in this barn was never, ever, going to be mentioned again. “I think I can bring ’em to mind,” said Granny, letting go and rolling up her sleeves. “Pleasant couple, as I recall. He’s a good husband, by all accounts.” She poured warm water from its jug into the bowl that the midwife had set up on a manger. “Of course, it’s difficult for a man working these steep lands alone,” Granny went on, washing her hands. Mrs Patternoster nodded again, mournfully. This time the midwife nodded gratefully. When she had fled, Granny laid a hand on Mrs Ivy’s damp forehead. As she moved her head she caught sight of the moon through the unglazed window. Between the light and the dark … well, sometimes that’s where you had to be. Granny didn’t bother to turn around. “I thought you’d be here,” she said, as she knelt down in the straw. THAT IS NOT MY CHOICE. ON THE VERY EDGE YOU WILL ALWAYS FIND SOME UNCERTAINTY. Granny felt the words in her head for several second, like little melting cubes of ice. On the very, very edge, then, there had to be … judgement. A few minutes later she felt the life stream past her. Death had the decency to leave without a word. When Mrs Patternoster tremulously knocked on the door and pushed it open, Granny was in the cow’s stall. The midwife saw her stand up holding a piece of thorn. Mrs Patternoster glanced down at the rolled-up blanket in the straw. Granny had tactfully placed it out of sight of Mrs Ivy, who was sleeping now. It was doubtful that anyone in Slice would defy Granny Weatherwax, but Granny saw the faintest grey shadow of disapproval in the midwife’s expression. “You still reckon I should’ve asked Mr Ivy?” she said. “That’s what I would have done …” the midwife mumbled. “You don’t like him? You think he’s a bad man?” said Granny, adjusting her hatpins. So much to unpack in that scene. The edges, the beginning, the judgment: these are the things that the vampires will try to use against Granny Weatherwax as they try to move in on the little kingdom where she lives. The locally prevailing views of the relative value of men and women, and Granny’s views of those views. Mrs Patternoster already mournful, and then fleeing, leaving Granny as the only conscious person out at the very edge until Death arrives. Granny, in arrogance or compassion, taking the burden on herself, and then reminding the midwife what it would have meant to give that choice to Mr Ivy. Though the tale gets more convoluted later on, at its heart, it is about Granny Weatherwax, and the choices she makes.